I love that question. Because it’s so silly. Anyone can teach anyone else if they want to and are open to learning. Last year at one of my events I had a woman who said she was feeling completely trapped. That she was constantly being pulled this way and that way and that she had no time to be herself. We shared and talked and at the end of day one she was certain she was learning and then she did it… she said she could not come back for the second day because her family needed her to drive and pick up and… and just like that she went right back to empower her family instead of herself. And if that’s what she loves, I say do it! But she just spent several hours sharing with us at different times how she didn’t feel valued and felt taken advantage of because of how her family treated her. You see, if you are not ready to hear a message even if you think you want to hear a message you will hear it but your old habits will pay it no attention. I recently had a woman tell me that her boyfriend was jealous, controlling and at times, mean to her. I asked her if she liked the way he treated her and she said no. She said she didn’t like it at all. And when I asked her what she planned on doing about it she replied, what can I do? I love him. What do you think? As a life coach, as a Professional Speaker in empowering yourself should I have set her down and told her what to do? How she should act? Why she shouldn’t allow someone to treat her that way? The answer is, NO! Notice that she did not invite my advice nor did she hire me for my advice. She did not ask what should I do, she merely said she did not like how he treated her but she loved him and therefore allowed him to treat her that way. So it was truly none of my business. You see we all allow things into our lives. I teach restaurants how to increase tips for their servers by giving amazing service in ways they have never thought of. And yet I watch customers ALLOW servers to treat them in a manner that is not exceptional. How many times have you or a friend said, my food isn’t great and when the server came over and gave your their patented, ‘so how is everything tonight folks?’ speech you looked at each other and said, “Fine.” You ALLOWED that restaurant to give you less than great food and great service. Yet don’t you go to a restaurant to get great food and great service? So why do you allow that to happen to you? You see, we are all guilty at times of allowing others to treat us in a certain way. I have the most perfectly respectable West Highland Terrier dog. I can take her anywhere and not leash her and she will stay right by me or if I am playing sand volleyball she will lay under a picnic table waiting for me to finish my game. Other players have brought their dogs but leashed them and when they bark and yelp during the game incessantly and the players will say to me, how do you get your dog to be like that? And all I say is, I trained her. You see, she now treats me as I taught her to treat me and everyone around me. Respectably. Do you know you train the people around you how you want to be treated by how you allow them to treat you? Your siblings, parents, children, friends and coworkers. They treat you exactly as you have taught them to treat you. So if your significant other, your boyfriend, girlfriend, partner treats you badly it is because you have allowed them to treat you that way in the past. How do you fix it? By empowering yourself to say, please don’t treat me like that any more, That is unacceptable to me. I won’t allow you to say, do that to me any more.And then take action on what you just said. I look forward to you teaching people around you how amazing you are and that they should treat you, as you treat them, as i they are all, AMAZING. 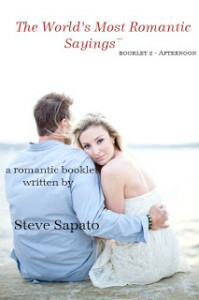 www.stevesapato.com and pick up my free ebook, This One Is For Me! on my site.